Brigid Laffan is Director and Professor at the Robert Schuman Centre for Advanced Studies, and Director of the Global Governance Programme, European University Institute (EUI), Florence. In August 2013, Professor Laffan left the School of Politics and International Relations (SPIRe) University College Dublin where she was Professor of European Politics. She was Vice-President of UCD and Principal of the College of Human Sciences from 2004 to 2011. 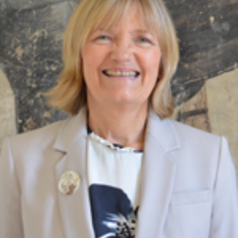 She was the founding director of the Dublin European Institute UCD from 1999 and in March 2004 she was elected as a member of the Royal Irish Academy. She is a member of the Board of the Mary Robinson Foundation for Climate Justice, the Fulbright Commission (until September 2013) and was the 2013 Visiting Scientist for the EXACT Marie Curie Network. In September 2014 Professor Laffan was awarded the UACES Lifetime Achievement Award. In 2012 she was awarded the THESEUS Award for outstanding research on European Integration. In 2010 she was awarded the Ordre national du Mérite by the President of the French Republic.